I once attended a writer’s event hosted by a high-end optics company, and while showing off the products, one of the reps commented on the unreliability of scopes made in Asia. Grimacing and shaking his head, he explained how reticles in non-US-made optics often move when they aren’t supposed to and sometimes don’t track as they should. His implication was clear: only cheap noobs buy scopes made anywhere outside the U.S. or Europe. I understand the arguments in favor of preserving American jobs, and I don’t mean to doubt the rep’s experience or the high-quality nature of U.S.-made products. But that conversation got me thinking: if you’re willing to buy a scope without the Made in the USA sticker, what are your options? What kind of features, quality, and price points can you expect from scopes made in China, South Korea, or the Philippines? 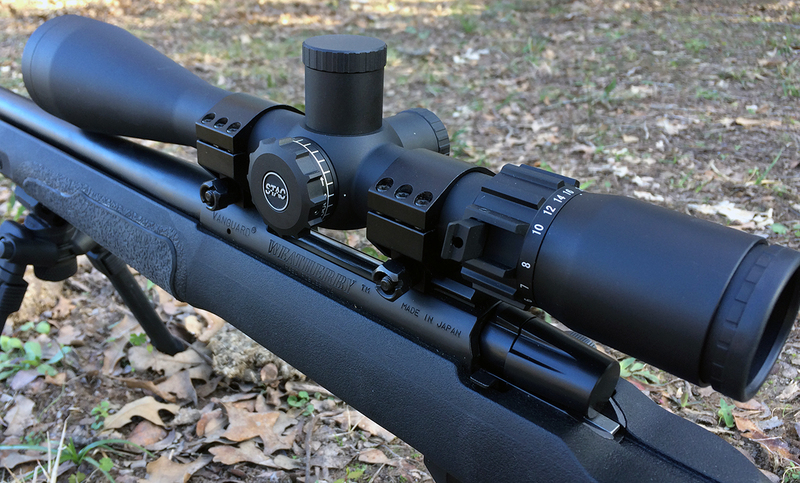 To get a sense of the market, I chose three scopes to test: the Vortex Strike Eagle 4-24×50, the Sightron STAC 4-20×50, and the Bushnell Nitro 6-24×50. The Vortex and the Bushnell both hit the market within the last year, so I knew I was getting the latest in terms of quality control. All three scopes can be had for under $600, and they all feature similar magnifications, dimensions, and weights. Each tube diameter measures 30mm. Also, most importantly, all three scopes come with a robust warranty. Such warranties have become industry standard these days, and they’re especially important when purchasing more budget-friendly scopes. 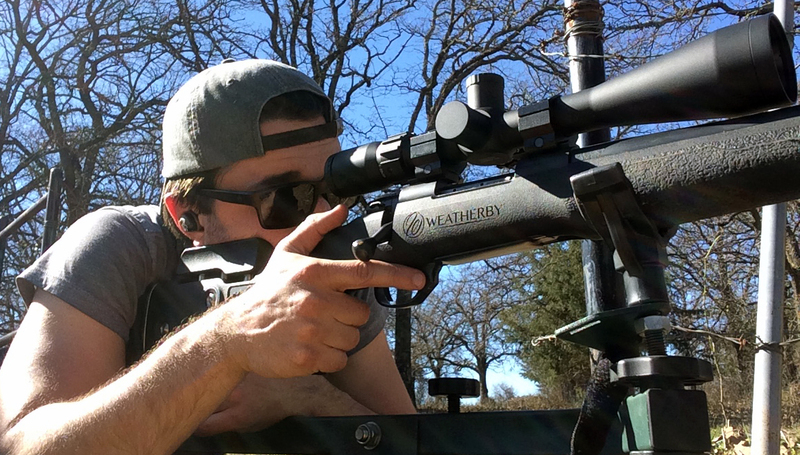 Sightron’s Limited Lifetime Warranty and Bushnell’s Ironclad Warranty cover all defects due to workmanship or materials throughout the life of the scope, though neither cover damage due to accidents (Bushnell calls it “wear and tear”). Vortex’s VIP Warranty takes it a step further, covering everything except loss, theft, deliberate damage, and cosmetic damage. So, with those preliminaries out of the way, let the battle begin. Scope Cost Made In Magnification Adjustments Max Elevation Click Value MIL Available? You can make your own comparisons, but I wanted to highlight three categories. For practical purposes, “focal plane” determines whether the reticle changes in size alongside magnification. In first focal plane scopes (FFP), the reticle expands as the magnification increases, which allows for range estimation at any magnification. In second focal plane scopes (SFP), the reticle stays the same size no matter the magnification, which keeps a consistent sight picture but requires trickier math to estimate distances. In this regard, the Nitro line comes out on top. 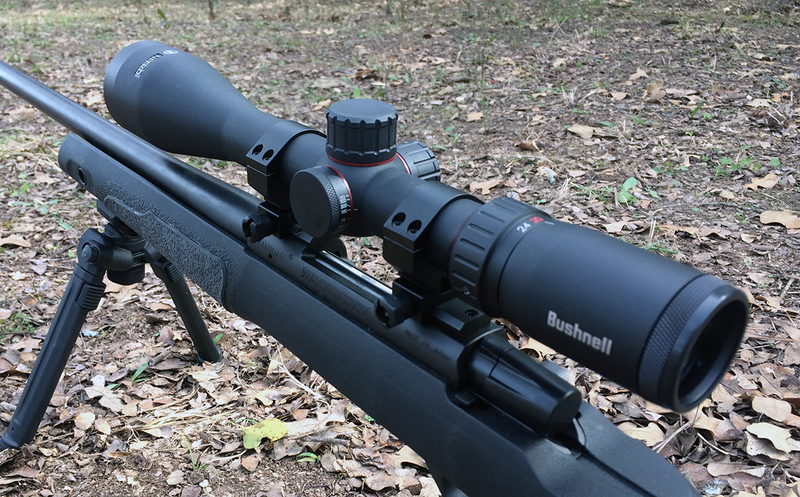 Bushnell offers scopes in both first and second focal plane varieties, though you’ll pay more for the FFP models. While Sightron and Vortex have FFP scopes in other lines, those scopes come with different features – and different price points. Sightron’s turrets are, in my opinion, the most versatile. They use a target-style marking system that allows the shooter to see the number of revolutions the turret has made, but they also include a screw-on cap, which is essential for any kind of hunting application. 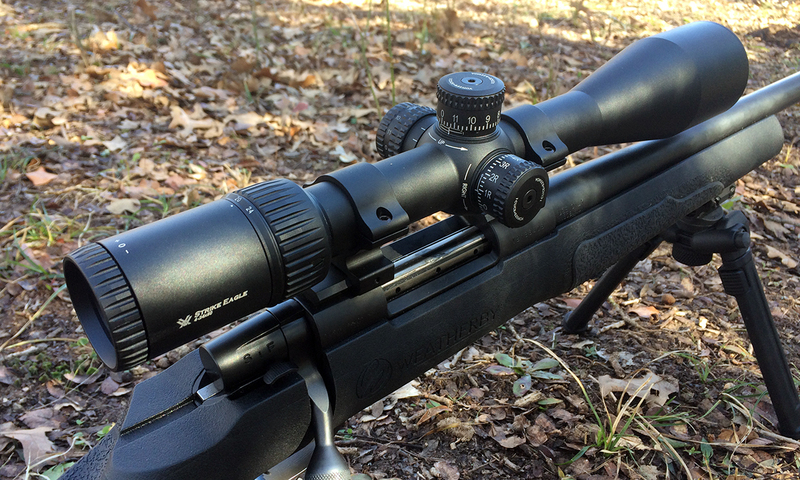 The Vortex scope doesn’t include caps, and the Bushnell uses a standard, non-target marking system. Each is fine for certain applications, but I like the versatility of the Sightron. Also, check out the field of view range among the three scopes. Vortex is the clear winner, but I was surprised at the limitations of the Bushnell. 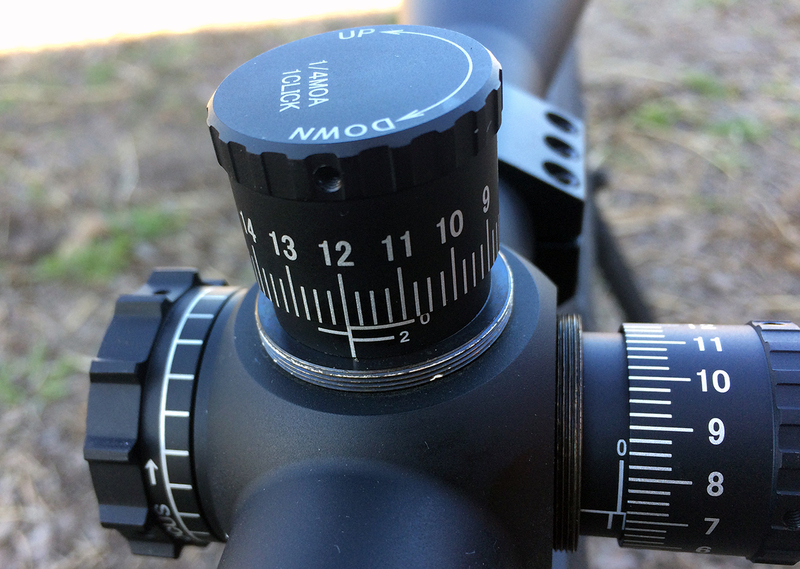 For a scope designed for hunters, it seems like it should have a greater field of view. I’m giving this one to Sightron. I didn’t have much trouble using any of these scopes. 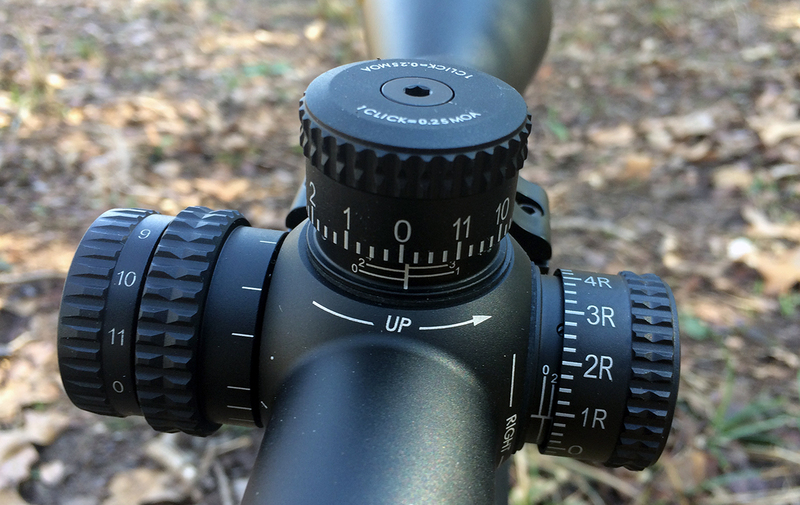 All feature simple dials for magnification and parallax/focus as well as adjustments for reticle focus. But while the Vortex and the Bushnell employ minimal serrations on the magnification and parallax dials, the Sightron features deep cut-outs to allow for excellent purchase on both adjustment knobs. The magnification dial even includes a flip-up lever for quick adjustments with gloved hands. There is one drawback. If you’re not careful, depending on how the scope is mounted, the cut-outs could take a chunk out of your hand while cycling a bolt gun. This never happened to me, but I did have to patch up one of my buddies. Sightron also wins the turret battle. Tactile turret clicks allow the shooter to count adjustments without looking at the dial. A nice, firm *click* also reduces the chance of miscounting, which is especially important if you haven’t spun the dial back to zero. The turrets on the Vortex and Bushnell felt fine, but the Sightron had that little bit of consistent resistance before firmly and audibly clicking over to the next hash mark. It was obviously superior to both other scopes, which is a big reason I gave it the nod for ease of use. The Vortex turrets move the reticle 12 MOA per revolution. The Bushnell turrets move the reticle 15 MOA per revolution and don’t feature markings to indicate the number of revolutions. The Sightron turrets move the reticle 15 MOA per revolution. All three turrets can be spun back to “0”, so returning to your zero is a piece of cake. The Bushnell (left) by hand, and the Sightron (middle) and Vortex (right) with an Allen wrench. Optical clarity is among a scope’s most important “features,” but, ironically, it’s also the most difficult to measure without extensive testing. (Seriously. Google “optical clarity scope test” and check out how nerdy it can get.) Judging image clarity is subjective, and fancy lens coatings don’t always translate into crystal clear images. This subjectivity is a prime breeding ground for moronic internet fights, so I’ll just post a few images below and stress that my evaluation is based on nothing more than my use of all three scopes and their side-by-side comparison. To my eyes, at least, the Vortex seemed to provide the best image clarity. I took all three to the range and used them on targets at 650 yards, and I was able to identify details more clearly with the Vortex than with either of the other two scopes. That being said, you won’t have any trouble seeing targets at 1000+ yards with any of these optics. All three are designed for long-range shooting, and each feature more than enough magnification and clarity to see targets from distance. Bushnell on 6x and 24x. Vortex on 4x and 24x. As you can see, each scope uses a markedly different reticle. The Vortex’s is the most detailed with numbered, MOA hash marks for holdover and windage. 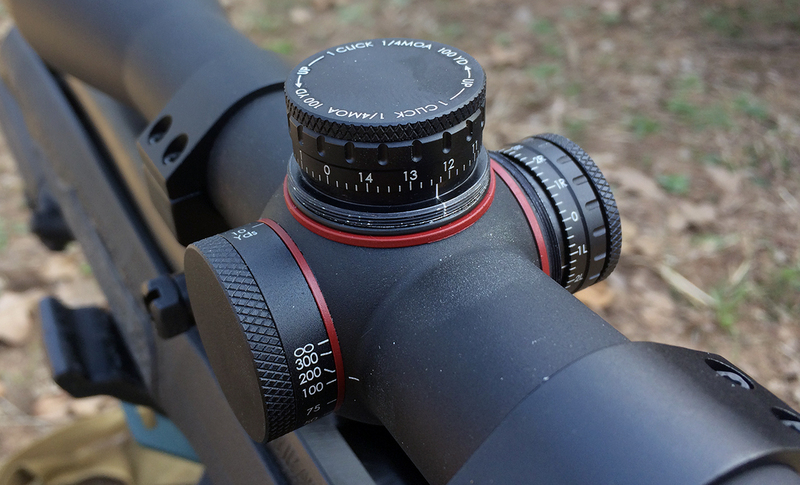 The Bushnell uses a simple, non-numbered hash system with the larger marks delineating 1 MOA at full magnification. While I appreciated the simplicity of this design, the lines appeared thicker than either of the other two scopes. Fortunately, Bushnell offers three additional reticle designs in the Nitro line, two of which employ thinner markings and FFP reticles. The desirability of a reticle design depends largely on the application, but I preferred the Sightron. The Sightron’s reticle uses ultra-thin markings that don’t impede sight picture, and I especially like the point-of-aim dot. Even at a long distance, the dot doesn’t cover the target, and it can even be used to quickly estimate range. Its minimalist design limits holdover and windage, but, as you can see below, the scope tracks true, so I wouldn’t have any qualms about dialing in those estimates. From left to right: Bushnell, Sightron, and Vortex. I used a Caldwell shooting sled during tracking tests to remove as many variables as possible. Here’s where the rubber meets the road. Tracking, especially elevation tracking, can make or break a long-distance shot, so it’s crucial for a scope’s reticle to move exactly as much as it’s supposed to. To test this, I drew a chart with 20 hash marks spaced evenly 2 MOA apart (2.094 inches). This gave me a full 40 MOA of elevation, which will get a 308 WIN out to about 1000 yards and a 6.5 Creedmoor to well beyond that. I strapped one of my most accurate rifles into a Caldwell Lead Sled and shot from 100 yards with Nexus’s match 308 WIN ammunition. I aimed each shot at the bottom bull’s eye but increased the elevation by 2 MOA before each one. Then, I returned the scope to zero and took one additional shot at the bull’s eye. Ideally, all 20 rounds should have landed somewhere near each hash mark, with some margin of error to account for the rifle’s accuracy. Nexus manufactures excellent 308 WIN match ammunition, which my rifles shoot well. As you can see, the Vortex and the Sightron performed well. Both tracked all the way up the ladder and returned to zero perfectly. The Bushnell was a different story. There were two distinct hiccups in the ladder, both of which I marked with a red circle and confirmed with a second shot. In the first (10 MOA), the scope didn’t track far enough, then returned to tracking the correct distance until 26 MOA. At that point, it tracked too far and then, once again, returned to tracking the correct distance. I should note that this line of Bushnell scopes is designed primarily for hunting applications, so it might be unfair to test it in the same manner as the other two scopes. Because game animals tend to move at inopportune moments, hunters often opt to use holdover reticle marks rather than dial in a shot with the elevation turret. The Nitro’s reticle can easily accommodate this method out to most hunting distances, so its sub-par tracking shouldn’t discourage the hunter from giving it a try. With great features, clear glass, spot-on tracking, and robust warranties, budget-friendly Asian-made optics can hold their own in today’s marketplace. While buying an American or European scope may have been imperative in decades past, today’s scope companies have improved quality control at their Asian manufacturers. Their products might not be able to compete with truly great glass, but they’re more than sufficient for shooters (like me) who want something that will hold up at the range and in competition. So, who wins the battle? That’ll depend on your intended purpose, but of these three scopes, I prefer the Sightron. Its minimalist design, versatile turret system, great performance, and simple reticle make it a fantastic option at the range and in the field.